When it comes to saving for a child’s college education, there’s no such thing as “too early.” You’ve made a smart decision by starting the process while your child is very young, and you’ve come to the right place. Hear from other families how MEFA helped them reach their goal of a college education. Find out the truth about saving for college – and dispel the myths. Review useful college saving tips that can help you make the most of your resources. The more you save in the years before college, the less you will have to borrow. Why is saving a better option? Because you pay interest on the money you borrow, but you earn interest on the money you save. 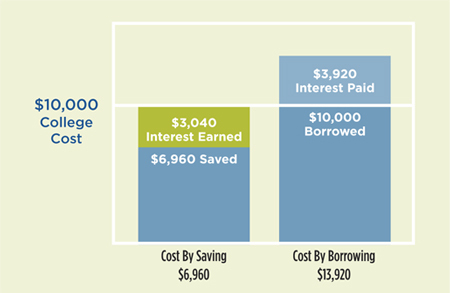 The chart below shows an example that compares saving and borrowing, based on a college cost of $10,000. As you can see, the actual out-of-pocket cost is far less when you save than it is when you borrow. Based on 10 years at an interest rate of 7%. This example is an estimate only and market conditions may change. MEFA’s U.Plan and U.Fund offer uncommon benefits to help you make the most of your college savings. Find out how these and other college savings accounts stack up against each other in our detailed comparison chart.